As the British cracked down, more ruthlessly on the revolutionaries in India and England, the anger against their atrocities grew more. It kept growing till the boiling point had been reached, and the time was ripe for an outbreak. All it needed was one single spark to light the flame. And that spark came in the form of a strapping young land from Punjab, Madan Lal Dhingra. Hailing from Amritsar, the sixth born of the city’s Civil Surgeon, two of his brothers were doctors, while two other were barristers. Coming from a well to do and influential family, Dhingra, could have settled into a life of luxury and comfort. Yet he was restless, driven by the call for Swadeshi, right from his student days at the Government College, Lahore in 1904. He led the student protest there against having to forcibly wear a blazer made of imported cloth, which led to his expulsion in turn. Having extensively studied about poverty and famines in India, he felt that only Swaraj( Self Government) was the solution. For some time, he worked as a clerk at a Tanga service in Kalka, Shimla, where his attempts to organize an union came to nought. It was then on the advice of his brother, he went to London, for studying the Diploma Course in Civil Engineering at University College between 1906-09. A very illustrious institution of learning where Dadabhai Naoroji was Professor of Gujarati and Ravindranath Tagore studied English Literature. Like most other Indian students in England, he was a regular to the India House founded by Shyamji Krishna Verma. His initial days, were spent in frolic and fun, and his good looks ensured, he was in the company of women mostly. The turning point came, at a meeting in India House that was addressed by Savarkar. Apparently Dhingra along with his friends, was making a noise in the adjacent room, that forced Savarkar to intervene. Having made up his mind, Dhingra now joined the National Indian Association, founded by Surendranath Banerjee and Ananda Mohan Bose in 1876. The Association was primarily a gathering of moderate Indian nationalists, who denounced extremism and believed in peaceful negotiation with the British. Dhingra acted as a double agent of sorts, publicly denouncing Savarkar in front of the British, to win their favor. He soon won the trust of Ms.Emma Josephine Beck, the secretary of the Association, and got to know the timings of visits of important officials. He had a fake “falling out” with Savarkar to convince the British officials, and also left India House. Staying for some time at Ledbury Road, in 1909, he began to plot the assassination of one of the most important British officials, Lord Curzon Wylie. Dhingra had earlier attempted to assassinate Lord Curzon, the British viceroy universally hated for his Partition of Bengal. However Curzon escaped twice, thanks to late arrival at the venue. His plans to assassinate the ex Governor of Bengal, Bramfield Fuller also came to nought, when the latter turned up late for the meeting. It was then that Dhingra decided to target Curzon Wylie, and not just because of the name. 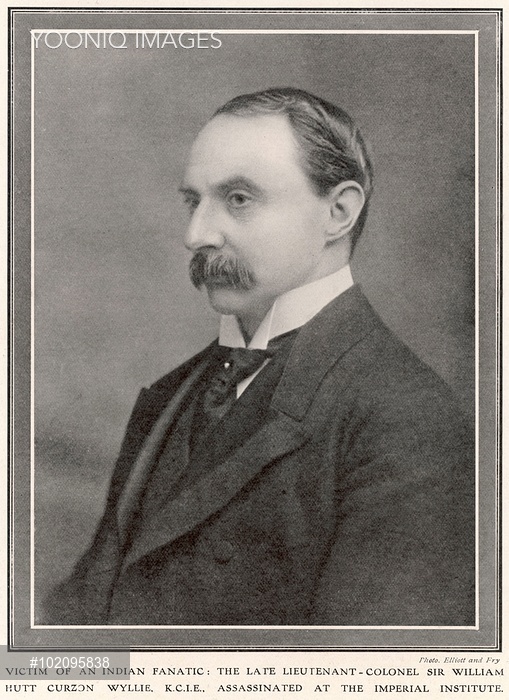 Wylie was one of the top ranking officers in the British Government. Serving the British Army in 1866, Wylie had entered the Political Department in 1879. He had earned a distinction for his role in the 1879 Afghan War, and later in Avadh, Nepal and above all in Rajputana. He was appointed the Political Aide-De-Camp to the Secretary of State for India, but more than anything, he was regarded as the “eyes and ears of the government”. Wylie headed, the Secret Police, a fact not known to any one, except those in the upper echelons of the British Government. He in turn, was keeping an eye on Savarkar and other revolutionaries at the Indian House. He even appointed an informer, Kirtikar at the Indian House, to get information. Kirtikar was however found out by Savarkar, and gave him all the information about the police operations under force. On the home front, things were not going too well. Savarkar’s elder brother Babarao, was arrested and sentenced for life to the dreaded Cellular Jail in Andamans. His home was confiscated, and Babarao’s wife Yesu died a destitute, homeless on the streets. The other factor was Savarkar being denied access to the Bar, after he completed his studies in 1906. Savarkar was charged of encouraging sedition by circulating pamphlets, advocating armed revolution and assassination. Given time till May 22, the trial was conducted on May 26, 1909, in camera. New charges were pressed, the letters by Savarkar were examined, and he was disallowed. The deportation of Babarao to Cellular Jail, and Savarkar’s trial, enraged the revolutionaries further, the situation was even more volatile now. Dhingra knew Wylie personally, having met him earlier on April 13, 1909 based on a recommendation from his brother Kundan Lal. Dhingra apparently wanted to discuss the letter, but in reality his aim was to get closer to Wylie, win his confidence. The moment came when a meeting of the Association was to be organized on July 1, 1909 that would be attended by a large number of Indians and Englishmen, in honor of Lady Lyall, the wife of Sir Alfred Lyall. Dhingra met Savarkar on June 29,1909 at Bipin Chandra Pal’s home in London, discussed the plans of the assassination with him. Savarkar asked Niranjan Pal to type out the statement, Dhingra would make after the assassination, and then gave him a Belgian make Browning pistol. “Do not show me your face again if you fail this time” said Savarkar to an emotionally overwhelmed Dhingra, as he took his leave. Accompanied by another revolutionary Koregaonkar, he had an early lunch and tea, left at 2 PM, cradling the revolver in his hands. He also bought a brand new dagger in a leather casket, placing it in his pocket. It was evening 7 PM, when the function started, Dhingra was dressed in a lounge suit and blue Punjab turban. He placed a Colt revolver in the right pocket of his coat, and the Browning gifted by Savarkar in another. He took a cab, arrived at the Institute, where Koregaonkar came also, with his pistol. When the time came for Wylie to leave, Dhingra approached him on the pretext of talking something. Just at the landing, coming closer to Wylie, Dhingra pulled out his Colt and fired two bullets point blank. As Wylie reeled, Dhingra fired two more bullets, a Parsi doctor, Cawas Lalkaka, who tried to save Wylie was also shot. However Dhingra’s plan to commit suicide however failed , as he was overpowered by the security guards around. He managed to even bring down one of the guards, but was ultimately subdued, and arrested. He was taken to the Walton Street Police Station, where the Police Officer asked him if any of his friends knew about this. To which Dhingra calmly replied “There is no need, they will know about my arrest tomorrow in the newspapers”. It was a smart strategy, which ensured none of his friends would be implicated. I will be covering the trial and execution of Madan Lal Dhingra, in detail in the subsequent post. This entry was posted in Indian Freedom Struggle, Maharashtra, Revolutionary Movements, Veer Savarkar and tagged Madan Lal Dhingra, Veer Savarkar. Bookmark the permalink. 3 Responses to Veer Savarkar- Assassination of Wylie by Madanlal Dhingra.